Six men have been jailed for a total of 59 years following a pitched battle between two Chinese gangs in Birmingham in which a man was killed. 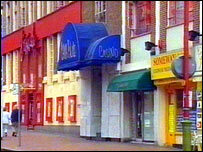 Birmingham Crown Court was told that what started as a trivial dispute turned into a 90 second bloodbath inside the China Palace Casino in the city's China Town. On Tuesday Philip Hung Chan, of Thomas Chapman Grove, Far Cotton, Northampton, was jailed for life for the murder of 46-year-old Mann Chung Li who was stabbed to death during the dispute. Two other men - Feng-Ching Lim, 30, of Hazelwell, Ford Rough, Stirchley, Birmingham and Jian Chen, 26, of Hawley Street, Margate, Kent - were sentenced to 12 years and 11 years respectively for attempted murder and conspiracy to cause GBH. A further three men - Feng-Ching Lim, 30, of Hazelwell, Ford Rough, Stirchley, Birmingham; Tszho Choy, 28, of Thistle Down Avenue, Burntwood, Staffordshire and Zong Dong, 25, of Lower Essex Street, Birmingham - were also convicted of conspiracy to cause grievous bodily harm and were given sentences of between seven and eight years. 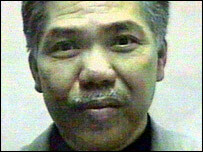 During the three month trial, the court had heard how Mr Li, who was head chef at the Tin Tin restaurant in Wolverhampton, was stabbed six times during the armed clash. Chan, who ran the Happy Gathering Restaurant in Northampton, had an ornamental dagger embedded in his stomach after the argument broke out between rival gang members at the China Palace Casino. Several people were injured by gang members using machete knives. On Tuesday, the dock at Birmingham Crown Court was crammed with the defendants, their interpreters - translating into Vietnamese, Mandarin, Cantonese and Hakka - and security guards. Passing sentence, Mr Justice Jowitt said: "It was an appalling incident of violence. "It didn't break out spontaneously, it was planned in advance. "One man died, another man must have come within a short distance of death when a machete penetrated through his skull." He added: "You (Chan) were the ringleader and you bear a grave responsibility that others younger than you are also in the dock." "The bloody battle inside here lasted just 90 seconds"